Easy steps to calm down during a busy work day. If you’ve ever found yourself wandering listlessly through the workday, stuck on autopilot as countless meetings and memos demand your attention, then you may be surprised to learn of a simple, effective solution to your weary inattentiveness. In the morning — Studies have shown that most stress hormones are released within our bodies mere minutes after waking up. Instead of thinking about the work day and obligations, try spending two minutes in your bed checking-in with your breath. If an outside thought intrudes, simply let it go and return focus to the breath. Following the drive in — Once you arrive at work, take five to ten minutes in your car to silently focus on your breath once more. Become curious about your breath — Silently observe its depth, pace, flow, and texture. Lean back, close your eyes, and enjoy this time that belongs only to you. Before your first meeting — Take two minutes to mindfully bring your attention to the task at hand. 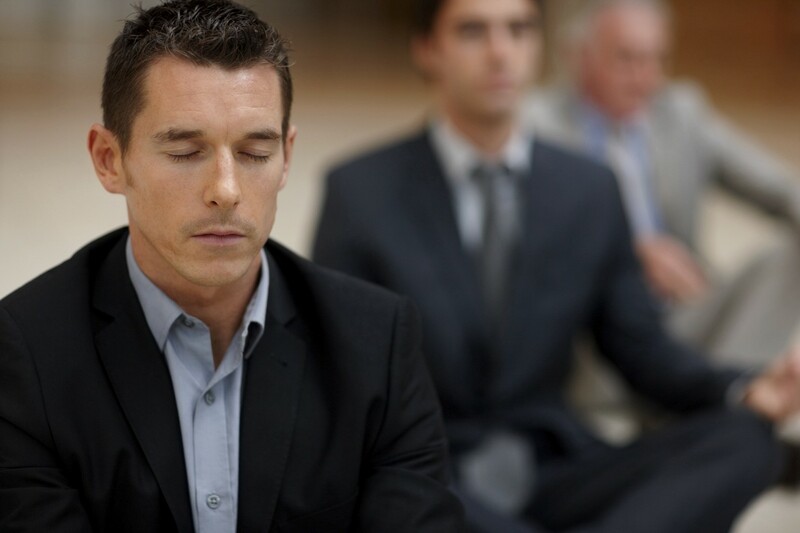 Ideally, these first minutes of the meeting should be silent, allowing everyone to start with a centered head-space. Finally, allow the meeting to end five minutes early (if possible) to allow the participants to mindfully transition into the next activity. As the day ends — Consider practicing mindfulness during your commute home as well. For at least ten minutes, turn off the radio, phone, and any other potential distractions. Try to let go of any intrusive thoughts that may (and will) pop up and use this time to pinpoint something you are truly grateful for. Then ,take a few deep breaths, let out a BIG sigh and release the day’s stresses, so you can focus on being fully present with your loved ones. Mindfulness is about focus and awareness, both invaluable traits in this age of shortened attention spans. It provides a tool to appropriately manage (without judgement) harmful, stressful distractions and helps an individual focus on whatever goals they need to meet. Experiment with these tips at your place of business for just a couple of weeks and see for yourself whether or not mindfulness increases your personal focus, productivity, and satisfaction. Originally published at www.recharj.com on March 3, 2017.